I. When Jeff Shea ’98 thinks back on Cal Lutheran, invariably his best memories include football. The record-setting Kingsmen punter cherished working with teammates day in and day out, and reveled in the camaraderie that comes from the tireless pursuit of a common goal. The same desire, in large part, drove him toward a career in the fire service, where he joined a team of a different kind. He rose from the rank of firefighter to battalion chief in nearly two decades with the Ventura County Fire Department. Teamwork took on a deeper meaning the night of Dec. 4, as Shea assumed command of firefighting troops assigned to do battle against what would grow into the largest fire in modern California history. As the Thomas Fire erupted that evening near his old hometown of Santa Paula, Shea was put in charge of assigning resources in the most ferocious and destructive section of the fire on Day 1: a 13-mile corridor stretching from the drought-ravaged hillsides just west of Santa Paula to the tracts of houses and apartments that run ever denser as they slope toward the ocean in Ventura. Pushed by Santa Ana winds gusting at up to 80 mph, the blaze at its most voracious was devouring an acre a second, by one calculation, as it blowtorched its way that first night nearly all the way to the sea. “That kind of fire activity is just unheard of,” said Shea, a Thousand Oaks resident and former CLU Alumni Board member, whose main job that first night was to try to figure out where the fire was going, get out in front of it and get people out of its way. Although an instinct to protect is Shea’s by nature, he didn’t always want to be a firefighter. Football was his first love, and he was good at it. He played multiple positions for Santa Paula High School’s squad and then found his niche as a punter once he committed to CLU in 1994, drawn by the opportunity to play college ball. Shea holds the NCAA Division III record for the highest punt average for a career and the CLU record for longest punt, having booted one that traveled 85 yards. He also is in a group of only five D-III college football players who have been named First Team All-American three times, and was the first three-time All-American punter in any NCAA division. He sought to extend his football career by trying out for several NFL teams, but his big league dream never materialized. Turns out, the business administration graduate was destined for a leading role on a different stage. “As a teammate, I remember Jeff being super-positive – the first guy to celebrate success, the first guy to pickup a teammate who was struggling,” said CLU head football coach Ben McEnroe, who was an assistant on the staff when Shea played. On the first night of the Thomas Fire, Shea assessed fire activity and planned for evacuations along the Highway 150 corridor between Santa Paula and Upper Ojai, an area he knew well because he grew up nearby and had his first firefighting job with the Santa Paula Fire Department. 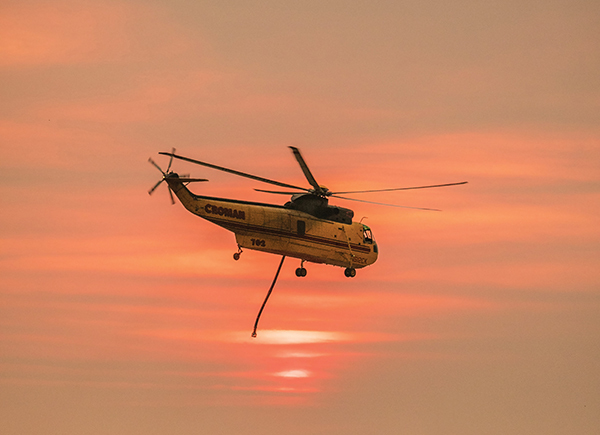 Because of the high wind warnings and low humidity levels forecast for that day, Shea said his department had significantly increased staffing, but the beefed-up firefighting force was still no match for the winds. It also became apparent on that first night that the 13-mile corridor between Santa Paula and Ventura, Shea’s field of command, would become the epicenter of the firestorm. Driving up the narrow roadways that provide access to the farms and rural homes that dot the western edge of the Santa Clara River Valley, firefighters encountered terrified people. The smoke was thick and choking, and angry red ember showers – palm fronds the size of boogie boards, Shea remembers – streaked the night sky, setting off more fire wherever they touched down, often miles ahead of the main blaze. For civilians in the path of the wind-whipped flames, disbelief and confusion took hold. Shea said he and his team put people in cars with strangers just to get them out of the area. He remembers driving up to one house where both cars were ablaze in the driveway and the occupants were still in their home with no clue what to do next. It got worse as Shea made his way into Ventura and the inferno began consuming entire neighborhoods. Somewhere in that chaos, as people sought to flee by all means, Shea was hit by a car. The powerful glancing blow tore the sole off his boot. Shea was checked out at the hospital and, hours later, was back on the frontlines. He would work the fire for six days straight. As he looks back, Shea said the Thomas Fire points up the importance of preparation, noting that his department and others have programs to help the public plan for emergencies. But he said it also points up the significance of teamwork. Firefighters from dozens of agencies across the state worked together to battle a blaze that was blamed for two deaths – a Cal Fire engineer from San Diego and a Santa Paula woman who died while trying to escape the flames. II. As fate would have it, Marisol Rodriguez ’94, MPA ’00, was the safety officer on duty the evening the first call went out. A fire, its ignition point somewhere near Steckel Park north of Santa Paula, had quickly consumed 50 acres and was on the move, driven by powerful Santa Ana winds. 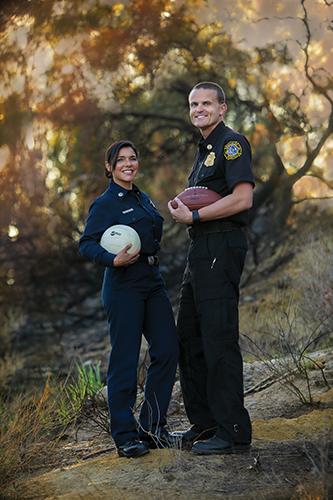 What that meant for Rodriguez, a captain with the Ventura County Fire Department assigned to the training division, was that her hopes for a tranquil Monday evening had evaporated. As the on-call safety officer Dec. 4, it was her job to assess hazardous conditions and develop a safety plan for firefighters battling the blaze. She had no way of knowing that this blaze, which would be dubbed the Thomas Fire, would be unlike any other she had ever worked. As Rodriguez drove toward Santa Paula, the hillsides north of the city were already awash in an angry orange glow, and like hundreds of other firefighters that night she headed into the flames. Fire roared on both sides of Highway 150 toward Upper Ojai, whipped by winds so fierce they felt like they would rip off the door of her pickup truck every time she stopped and got out. Telephone poles were on fire, as were the power lines in between them. The ember wash was so severe that those without goggles could barely see, their eyes red and nearly swollen shut. “People were in a daze, they were seeing things they weren’t used to seeing,” said Rodriguez, who studied business administration as an undergrad at Cal Lutheran and then followed with a public administration degree in CLU’s master’s program. She has also earned a Ph.D. in industrial/organizational psychology from Capella University. So how did a business major end up on the front lines of California’s largest fire? In no small measure, she has CLU to thank. Born in Buffalo, New York, and raised in the San Fernando Valley and then Newbury Park, Rodriguez said she was drawn to CLU because it was close to home and it offered her the opportunity to continue playing volleyball, a longtime passion she nourished as an undergrad all four years. But she said she also was drawn to the school because of its warm and welcoming faculty and students, and the broad range of educational opportunities it offered. One of those was the chance to intern starting her junior year with the Ventura County Fire Department, thanks to a partnership CLU had forged with the fire agency. That internship revealed a world she knew little about, and one she had not previously known was open to women. In fact, it wasn’t until she started with county fire that she met her first female firefighter and realized this could be her path as well. “I don’t think a lot of young girls think it’s an option. They don’t really see us,” said Rodriguez, noting that even at her agency only 11 of the 450 firefighters are women. Rodriguez was hired by Ventura County fire in 1995 and worked her way up from firefighter to engineer to fire captain. Now assigned to the training division, her responsibilities include serving as a Community Emergency Response Team instructor, running fire academy programs and acting as a public information officer for the department. Those responsibilities also regularly include being the department’s on-call safety officer, which thrust her into the thick of a fire that would rage for more than a month and blacken an area nearly the size of Los Angeles. The first 24 hours of the Thomas Fire were the most explosive and destructive. As she continued the loop through Ojai and headed back on Highway 33 toward the coast, Rodriguez recalls hearing on the radio the first reports of homes being consumed in the hillsides above Ventura. Rodriguez headed toward those hillside neighborhoods, stopping to help people who were outside their homes and on their roofs, using garden hoses to defend against the flames. This was not brush catching fire, but ornamental shrubbery and palm trees and patio furniture going up in flames as embers continued to wash across neighborhoods, touching off one blaze after another. The scene was nightmarish. But Rodriguez said there also was beauty in the human story of that night, as firefighters and neighbors worked together to beat back the inferno. Assigned to the Thomas Fire for more than half of December, Rodriguez said she also saw plenty of evidence of the value of fire department programs aimed at reducing fire hazards around homes and training homeowners how to respond. That puts her in a unique position, in her current assignment, to help raise education and awareness about those campaigns. It also puts her in a position to help find recruits like her, young people who simply haven’t been exposed to what a great job firefighting can be.